On the heels of David Lee Roth‘s recent comments about playing Yankee Stadium in 2019, our very own Eddie Trunk speculated that Alex and Eddie Van Halen were interested in again working with their former bassist, Michael Anthony. 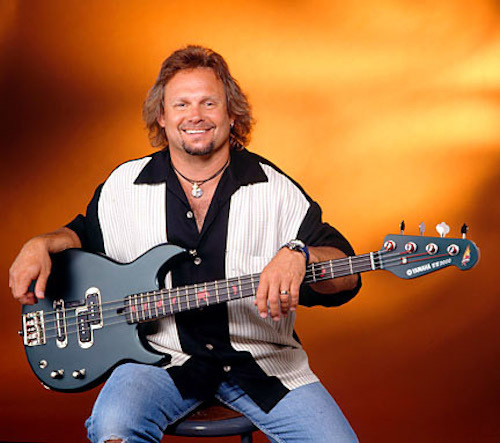 When iHeartradio asked bassist Michael Anthony if there was any truth to the rumors that he will be rejoining Van Halen. He added that while he did run into Alex Van Halen “a few years back,” the two didn’t get into anything more than small talk. Anthony last performed with Van Halen in 2004. He was replaced in the band by Eddie’s son Wolfgang in 2006. Trunk made it clear that what he related on his Sirius/XM radio show was merely a rumor, but he added that it was from a source within the music industry. “The rumors from reliable sources — but still rumors that are unconfirmed — is that the band will tour in 2019 with the original band, which would mean the return of Michael, and that there is gonna be some sort of stadium package,” Trunk said at the time. Van Halen last toured in 2015. Trunk says that there have been unfounded rumors of a new tour each year since then. While he acknowledged that what he’s heard this year seems more credible than what he’s heard in the past, he did not dive into why the Van Halens might be considering bringing back Anthony. Since leaving Van Halen, Anthony has been busy collaborating with Sammy Hagar on a number of projects, including Chickenfoot and the pair’s latest band, Sammy Hagar & The Circle, which will release its debut album, Space Between, in January. Hagar lobbied for a Van Halen reunion including himself, Anthony and Roth for years. He said last year, however, that he had given up trying to communicate with the Van Halen brothers after they didn’t reach out to him on his 70th birthday. Wow that is a great pic. Hair looks great. That’s gotta be late 90’s, right? All hail Michael Anthony. Saw him with Van Hagar 5 times and he’s a great performer and those backing vocals are legendary, right? I hope they get together but count me out if DLR is on the mic. Saw that in 07′ & 15. That’s enough for me. The Van Halen brothers probably noticed the business the recent G n R tour generated and concluded “money talks”…. The lineup that created the greatest/my favorite debut album of all time! I would love it if this Van Halen lineup reunited for a tour! Yeah, Dave is not a great live vocalist, he never was….but he was a great showman. I think Lynch Mob’s, and Blue Murder’s, debut albums were also pretty good. For as many great debut records there are, there are many that are fall very short. For some bands it’s their second album, for others their fifth or sixth. I would think it would be better to progress as you go, because if you set the bar so high with your debut, it is sometimes very difficult to live up to those standards. Many people say that about Guns N’ Roses. Brother Doug! I agree about Boston, too! That’s my #2 favorite debut album! IMO, every song on that album is great. And “Foreplay” is such a great instrumental prelude to “Long Time”! You’re right Dana! I think Def Leppard’s 2nd album is their greatest album, as well as one of the greatest 2nd albums. IMO, I think G m R’s first album, while good, is way overrated. But based on their music output, i think G n R is totally overrated band. There are many people that feel that way about GN’R. So true, Dana. VH probably comes as close as anybody to living up to expectations on their second album. For others, it’s their second album that takes off. Case in point – Def Leppard! High ‘N’ Dry is probably the greatest sophomore album ever! And of course they just continued to get bigger and bigger, (maybe not better) but definitely bigger! How many albums can you say where every single song on it was/is still played on the radio? Not just that, that’s not what makes Boston’s debut album so great, it’s the fact that every song is as close to perfect as can be! Yes they had many years to work on it, but it doesn’t take anything away from it’s excellence! Blizzard of Ozz must rank close to VH as greatest debut album, no?! I love both, I feel like Blizzard transcends. Brother Doug! Every song on that first Boston album was played on the radio, and they were great songs! Yeah, Boston took a long time between albums, but IMO, their albums were all real good! Tasker, I agree with your Blizzard comment, in concept. But I have a hard time considering it a debut since Ozzy’s work with Sabbath. And IMO, another greatest 2nd album is Diary of a Madman. My favorite Ozzy album. Dang, we could do whole conversations about best 1st, 2nd, 3rd, live, etc…albums. My favorite all time album would probably be KI$$ Alive, though. Good technical point, Rattle. I certainly agree that Dairy is a fantastic sophomore record by Randy & Ozzy. It looks like Monet is going to get his wish; Tony is re-mixing Forbidden for imminent release. I quite like all of the post-Dio Tony Martin albums; great writing; really, if it was any other band but Sabbath those albums would most likely be regarded much higher. Forbidden is a collection of first-class metal songs actually…. What’s funny about that first G’n’R record is that the band doesn’t even perform on most of it; session players, including a singer, were brought in because the band was so out of it…so out of it, they thought they played on it, in fact. That’s really good news. I’m totally excited about this. A total victory for die hard fans. Iommi is doing the right thing here. Also, I don’t hear any problems with Forbidden’s mix…unless you want to nitpick it; it sounds fine.